Examples are based on .NET 4.5 and Subversion 1.7, using AnkhSVN 2.4, TortoiseSVN 1.7 and VisualSVN Server 2.5. PreCommitHook – contains the entry point of the program and runs the pre-commit checks. SvnlookFacade – a facade to some of the features provided by svnlook.exe, which is used to query SVN repositories. The implementations are very straight forward and don’t provide any robustness when confronted with code like “var c = console; c.log(‘Hello World!’);”. As suggested in the TortoiseSVN documentation, commit validation can be skipped by entering a certain phrase in the log message. As stated previously SvnlookFacade only supports the few commands relevant to this example, but it should be fairly intuitive to extend the class to provide any of the available features described in the svnlook documentation. The executable itself (svnlook.exe) is usually found alongside an installed SVN server. Various server implementations can be downloaded from http://subversion.apache.org/packages.html#windows. // "item properties changed", "file contents and properties changed"
Using the hook simply requires naming the executable “pre-commit.exe” and copying it into the “hooks” folder of the repository in question. 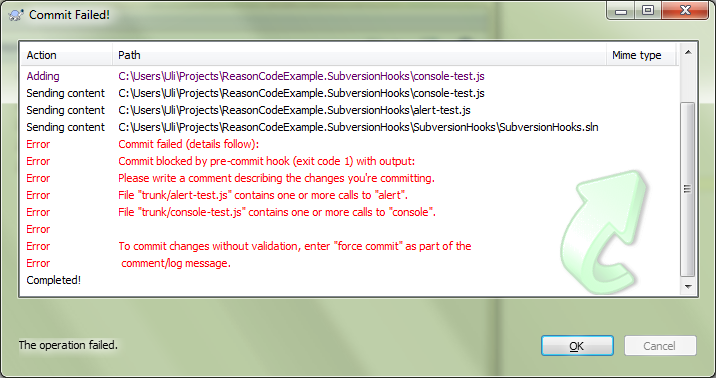 This entry was posted in C#, Subversion and tagged Subversion, SVN, SVN hooks. Bookmark the permalink. 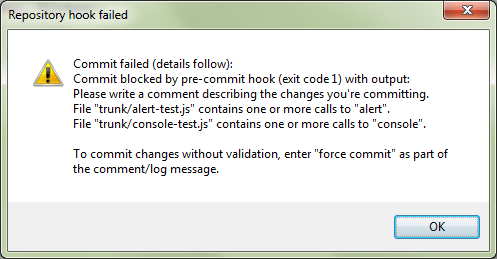 Commit blocked by pre-commit hook (exit code -2146232576) with no output. Any chance you can help to understand what am I missing? Note – I used the above code as is, in addition to adding the needed references : Linq, etc..at the top of the c# script file. I can send you the script file or paste it here, if needed. Please let me know. By The Way, I tried the above with VisualSVN and TortoiseSVN combination. I also tried removing the new line characters in the error messages. I also tried removing all the logic and just did a plain “no matter what reject the commit by displaying an error message” – The commit expectedly got rejected, how ever the error message isn’t getting out via the TortoiseSVN window. That’s where I got stuck. You can send your code to M8R-c2k4aw@mailinator.com – I’d be happy to take a look at it. Since it seems there’s an issue redirecting and reading the standard output stream you could try replacing the call to Console.Error in the catch block of static int Main with a basic file write (i.e. log any exception incl. stack trace to a temporary file). That way you might get a bit more debug info in case the Windows Event Log doesn’t contain anything useful (based on the returned error code it looks like *something* throws an exception). My implementation is still used where I work. We currently use TortoiseSVN 1.7.6, VisualSVN Server 2.5.8, VisualSVN 3.0.4 and Visual Studio 2012 on Windows 7 64-bit. Appreciate for the Code Review Offer Uli. I sent the code to the above email. I will also try redirecting the error-output to a file and see if really any error text is getting out at all. @VC: just in case you still have that problem: in my case it was a missing .Net Framework on the server running svn. After I changed the project settings to 3.5 (which was installed on the server) it worked without problems.